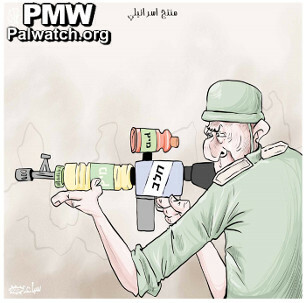 Palestinian Media Watch has documented that the PA urges Palestinians to boycott Israeli products and prohibits normalization in any way with Israel. However, when it comes to its own conduct, the PA shows its hypocrisy. "On Monday a post from the official Facebook page of the PA Ministry of Employment regarding a meeting held in the ministry's building - during which refreshments were served that included bottles of Israeli Tapuzina juice - was shared on social media. Following the spread of the news item and the picture, in addition to a wave of rage that it awakened, the ministry immediately removed the picture." The PA tells it people not to use Israeli products because they claim buying Israeli products finances Israel's military, which then uses its weapons to fight against and kill Palestinians. Boycotting Israeli products is taught to children as well. A campaign by the PA Ministry of Education and the PA Ministry of Economy to encourage "boycotting the Israeli products" took place in PA schools in 2017. An exhibit at a girls' school in Jenin showed bloody disembodied hands and a doll with its head removed. Around them were scattered Israeli products and missiles with logos of Israeli companies, among them the dairy company Tnuva, teaching that buying Israeli products facilitates murdering Palestinians. Palestinian teacher Ghada Abd Al-Rahman: "The goal of our campaign is to boycott Israeli products and support Palestinian products, because if we buy from the occupation, that money goes to weapons and they will shoot our sons." Palestinian girl Manal: "First of all, I created the website about boycotting Israeli products." Official PA TV host: "Bravo, applause! You are so talented." Girl: "There are two websites, one in Arabic and one in English. Now I have started the fourth page with the slogan 'The boycott is Israel's silent pain...'"
Host: "Congratulate Manal! I want these things to be circulated, Allah willing, and I hope that they will be circulated to all the schools." Whereas the PA’s boycott campaign seems to have influenced school children, it appears that PA ministry employees have either not been listening or that the PA applies a double standard when it comes to its own behavior. 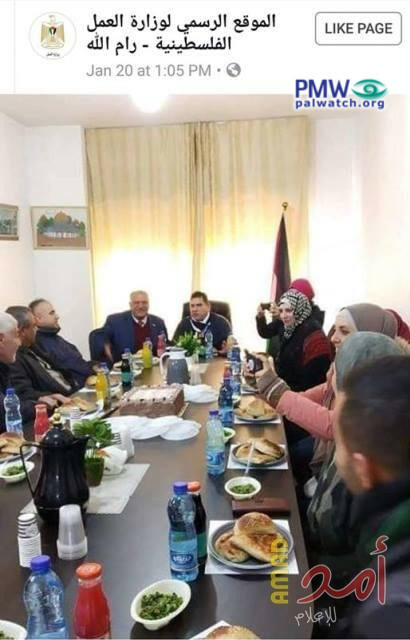 Headline: "Following the wave of rage: The [PA] Ministry of Employment in Ramallah removes a picture of an internal meeting at which Israeli juice [was served]"
"On Monday [Jan. 21, 2019] a post from the official Facebook page of the PA Ministry of Employment regarding a meeting held in the ministry's building - during which refreshments were served that included bottles of Israeli Tapuzina juice - was shared on social media. Following the spread of the news item and the picture, in addition to a wave of rage that it awakened, the ministry immediately removed the picture. Activists emphasized that this behavior contradicts the Ministry of Employment's call to boycott Israeli products and support the [Palestinian] national products." The picture accompanying the article shows the refreshments on the table at the PA Ministry of Employment's meeting.